Generally one’s top concern is how to select a brand when it comes to buy one electric unicycle. Airwheel comes as customer’s optimal choice due to its high price-performance ratio and premium reputation among customers. Electric unicycle is designed to be an intelligent wearable gadget for personal mobility specifically. Powered by green and intoxicant-free lithium battery, Airwheel is eco-friendly and emission-free. In the recent years, electric unicycles have been prevailing worldwide as a new generation of transporter. Normally, the purchasing behavior is derived from the trust in the seller/manufacturer, e.g. 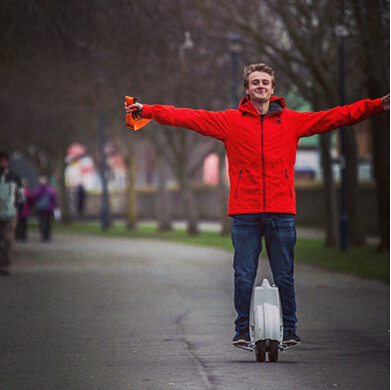 a customer buys an electric unicycle because he/she has trust in Airwheel Technology. Airwheel R&D team is backgrounded by mass mobile phone production and is thorough in production, after-sales and logistics process. Thanks to its profound background and deep understanding of electric unicycles, Airwheel optimizes production and sales in a short period as a startup. For customers, another major concern is quality and safety. As the latest intelligent transporter, Airwheel electric unicycle is the fruit of innovative spirit and hard work, as well as the optimization of core components and details. To be specific, Airwheel is driven by a state-of-the-art Mag-lev motor and powered by a Sony Li-ion battery pack, which features 1,800 rechargeable times, 2.9 times battery range and 3.8 times life expectancy of average Li-ion batteries on market. Branded product features more humanized design and considerable details. Airwheel electric unicycle is highlighted by an exclusive auto-shutdown function when wheel’s idling. In addition, a speeding protection activates when speed exceeds 12km/h. Considering the fact that everyone learns at different pace, Airwheel’s design aims at better and solider use experience from beginning, take the latest Q-series and S-series, it only takes 5 min to get a hang. Relentless innovation keeps a Hi-tech product thriving and robust. Innovation brings rapid upgrade as well as more advanced extensions. Airwheel one wheel scooter will integrate more thrilling functions besides transportation e.g. cross-country, music player, communication and remote control. Airwheel leads the trend and sets the standard in this section for its premium quality and supreme upgrade speed. Nowadays Airwheel is an enterprise integrating R&D, production and sale, and is always one step ahead of other competitors. However Airwheel will not stop its pace, it has already set out for the next target- electric manned aircraft! Next：Airwheel. Pojazd który czyta w Twoich myślach.